Imerge introduces MS1-HD media server with Blu-ray drive | What Hi-Fi? This enables owners to store and play back Full HD, 1080p content and upscale standard DVDs to 1080p resolution. In essence, the MS1-HD is a media server for music and movies. It delivers high-definition content to any room in the home and can be controlled using its own iPhone-style touchscreen controls or an actual iPhone app if the user prefers. The MS1-HD can be used in conjunction with Imerge's XiVASafe hard drive components to build a system with as much digital storage as the ownerrequires. 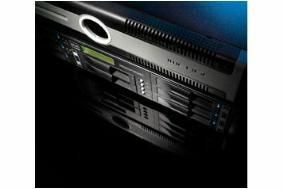 For example, the flagship XiVASafe iSCSI chassis has a massive 12TB of storage – enough for 18,000 uncompressed CDs, 1800 DVDs or 300 Blu-ray discs. Sound is handled by an audio board equipped with Wolfson Delta-Sigma 24-bit DACs. The system comes pre-installed with a wide selection of albums from Universal Music, and cover art and metadata search facilities encompassing GD3, Gracenote and AMG. And it will connect seamlessly with the forthcoming XiVA Music Store, an online music download service to be provided by 7 Digital. Prices for a MS1-HD + XiVASafe system start from £8930 for a 2TB set-up.